Rio Grande senior Roanderson Severino scores a run during the first game of Friday’s doubleheader at Bryan College. 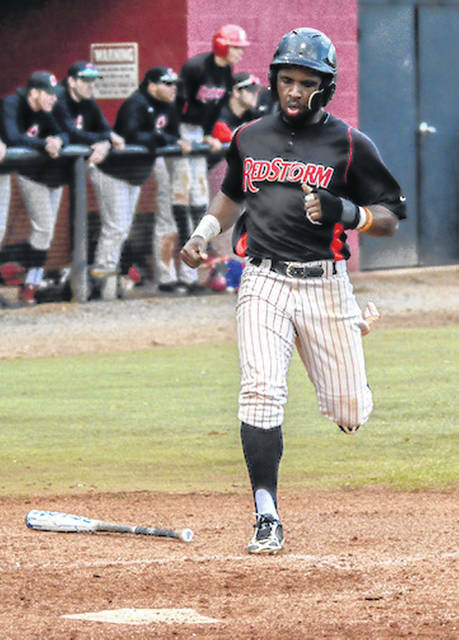 The RedStorm won game one, 4-3, while the Lions rallied for a 4-2 win in the nightcap. DAYTON, Tenn. — David Rodriguez drew a two-out, bases-loaded walk in the top of the seventh inning to force home the go-ahead run and lift the University of Rio Grande to a 4-3 game one win over 15th-ranked Bryan College, Friday afternoon, in non-conference baseball action at Center Field. The host Lions rebounded to post a 4-2 win in the nightcap. Rio Grande finished the day at 4-1 after the split of the twinbill. Bryan was playing it season opener. Rio used a three-run second inning in the opening game to erase an early 1-0 deficit, but the Lions pushed across single markers in the fourth and sixth innings to tie the knot the score at 3-3. The RedStorm regained the advantage, though, in the top of the seventh. Senior Roanderson Severino (Reading, PA) reached on a one-out single and stole second. One out later, junior Dylan Shockley (Minford, OH) was intentionally walked and junior Caden Cluxton (Washington Court House, OH) was hit by a pitch to load the bases. Bryan called on relief ace Jesus Astudillo to get out of the jam, but the right-hander walked Rodriguez – a senior from Santo Domingo, D.R. – to force home Severino with the go-ahead run. Shockley, the last of three Rio pitchers, retired the side in order in the home seventh to nail down the victory. Shockley and Severino also had two hits and a run batted in for the RedStorm, while junior Kent Reeser (Miamisburg, OH) doubled and drove in a run. Gabe Howell went 2-for-4 with an RBI, while Jacob Justice had a double. Dalton Ross, the second of three pitchers for the Lions, took the loss. In the nightcap, Rio Grande appeared poised for a sweep until a sixth inning rally by the home team. After the first two batters were retired routinely, David Scoggins singled and Logan Peterson followed with a walk, prompting Rio head coach Brad Warnimont to lift junior starter Zach Kendall (Troy, OH) for Shockley. The move backfired, though, when Logan Cain deposited an 0-1 pitch over the fence in right field, turning a 2-1 deficit into a 4-2 Lions’ lead. Rio Grande threatened in the top of the seventh by loading the bases with two out, but Astudillo struck out freshman Clayton Surrell (Carroll, OH) to seal the win. Senior Michael Rodriguez (Santo Domingo, D.R.) had a pair of hits in the loss, while Shockley doubled and drove in a run and freshman Cole Dyer (Wheelersburg, OH) hit the first home run of his collegiate career. Kendall suffered the loss for the RedStorm, while AJ Rolle earned the win for Bryan. Peterson had two hits and a run batted in for the Lions, while Lake Burris had a double. Rio Grande returns to action on Saturday with a doubleheader at No. 12 Tennessee Wesleyan. First pitch for game one is set for 1 p.m.